Excited pupils got a closer look at the progress made with their new school in Purfleet as investment in new schools in Thurrock continues. A group of students from Harris Academy Riverside, who are currently based at Harris Primary Academy Mayflower in Chafford Hundred while construction is completed, had the chance to check in on how the work is progressing at a topping out ceremony last week. The new free school in London Road, Purfleet, which is being funded by the Department for Education (DfE) and built by Kier Construction, will eventually provide 1,150 new secondary school places and the building is scheduled to open in time for September 2019. Earlier this month, Thurrock Council also agreed to fund a new £500,000 3G sports pitch at the school. Cllr James Halden, Thurrock Council’s portfolio holder for education, said: "We are committed to ensuring all young people in Thurrock receive the best possible education and, together with our partners, are investing more than £70million to create over 3,500 new school places in the borough. "I am delighted to be working with the Harris Academy and the Department for Education on this important project, which also forms a vital part of the planned regeneration of Purfleet and is an example of how we are getting important community infrastructure in place ahead of new housing. "It was great to be able to get a closer look at the progress that has been made and celebrate this important milestone, as well as share the exciting news with pupils that we will be funding a new 3G sports pitch at their school." Richard Bysouth, Operations Director at Kier Construction London, added: "It is important that we celebrate project milestones, such as the topping out, to recognise the hard work and collaboration that goes into such a construction project from all stakeholders. "Even at this early stage of the project the buzz of excitement from the students who toured their future school was a real reminder of the value of investing in and constructing new school buildings. 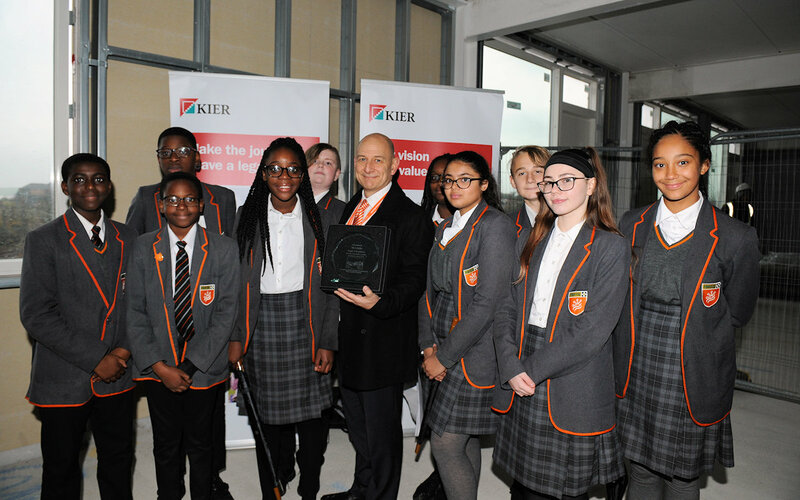 "Kier are proud to be the DfE's construction partner for the Harris Academy Riverside." Nicola Graham, Executive Principal of Harris Academy Riverside, said: "We are very excited to see the progress of the building and to celebrate this milestone. "It is so gratifying to bring a brand new secondary school to the Purfleet community and we are very grateful to Thurrock Council for their help and support."